Teslacigs Citrine 24 Sub-ohm Tank - Budget Vaping! Discussion in 'Commercial Coil Atty Reviews' started by Timwis, 10/2/19. People Really, I Mean Really Like You! 1000 Likes! Hi Ecigssa members, In this review i take a little look at the Citrine 24 Sub-ohm Tank from Teslacigs. The Citrine 24 Sub-ohm Tank was supplied for the purpose of this review by Gloria from Teslacigs. The Citrine 24 is a 24mm budget Sub-ohm Tank coming in various colours. The Tank is claimed to be sturdy despite being mainly made from PC and is not disposable as the tank functions in the same way as a more expensive metal tank including replacing the coils. This sought of tank certainly has it's uses but the main question does it give good flavour and cloud, i give my opinion! 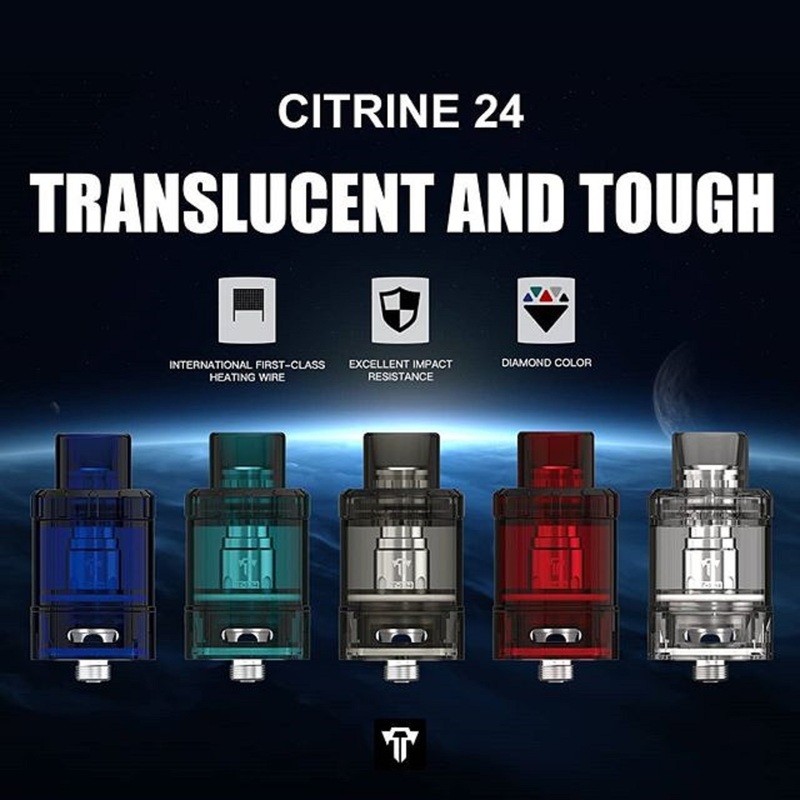 The Citrine 24 came in a tiny cardboard box and once opening i was met by a fully transparent Gray all plastic tank, i say all plastic but on further inspection you can see that a lot of the inside is actually metal which should help with it's durability. The other colour versions are Blue, Green, Red and Black, all are fully transparent. Up top we have a drip tip that looks like it could be removable as there is a metal piece visible underneath but this is what screws onto the air pipe but does help strengthen where the drip tip joins on to the top-cap. Both top-cap and bottom section have texturing for grip, the base section has dual fully adjustable airflow slots, it adjust just as well as on a metal tank. Through the main tank section which is plastic rather than glass you can see the metal air pipe attached to the pre-installed coil. The base see's more metal, we also have a Gold plated 510 pin surrounded with insulator, the threading is Stainless Steel. The tank at the end of the day is mainly plastic so does look cheap compared to a metal tank but for what it is certainly the Gray one i received looks not too bad at all. 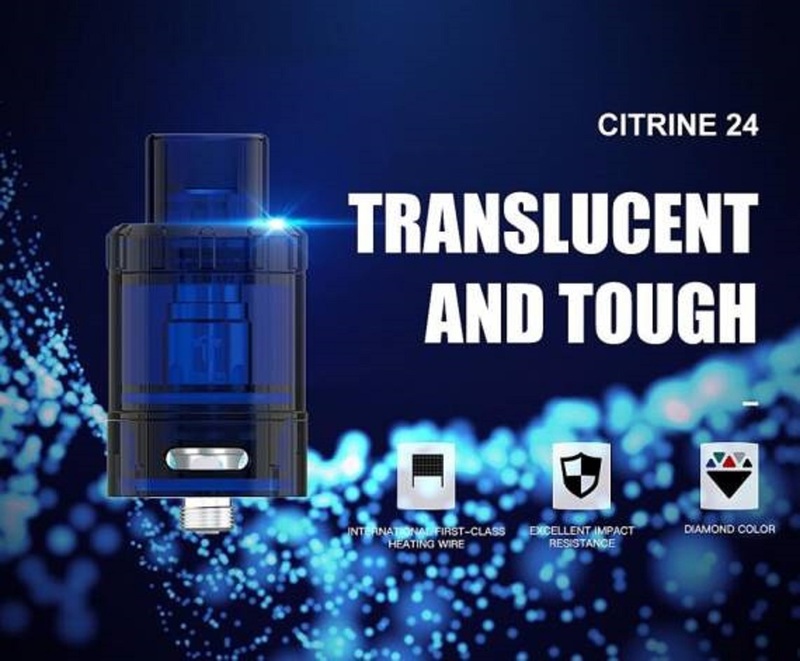 As mentioned the Citrine 24 is made to function just like any other sub-ohm tank and the top-cap unscrews to reveal 2 large kidney shaped fill ports. What Tesla have done well is to make all threading metal on metal, the already mentioned metal section the drip tip fits over screws onto the air pipe to seal the tank, the threading is very good. From the outside when the tank is screwed together the base section looks like an all plastic affair, but when it is unscrewed from the tank i found the only plastic is the airflow control ring the rest is metal. This gives the tank more strength and durability than what would be expected of a plastic tank and also all threading as mentioned is metal on metal. The coil screws into the base just like on many tanks and when screwing the tank together the top of the coil screws on to the air pipe, the main plastic tank section is sealed with an o-ring. The Citrine 24 is marketed as a budget sub-ohm tank that is strong and durable despite being mainly made of plastic so despite the budget price the Citrine 24 no doubt will be (no prices yet) there is no excuse for not supplying a spare coil. The coil you do receive is the T-X4 mesh coil with a resistance of 0.17ohm and rated between 40w and 60w, their is also a 0.15ohm mesh coil (the T-X5) available for the tank which is rated between 60w and 80w. 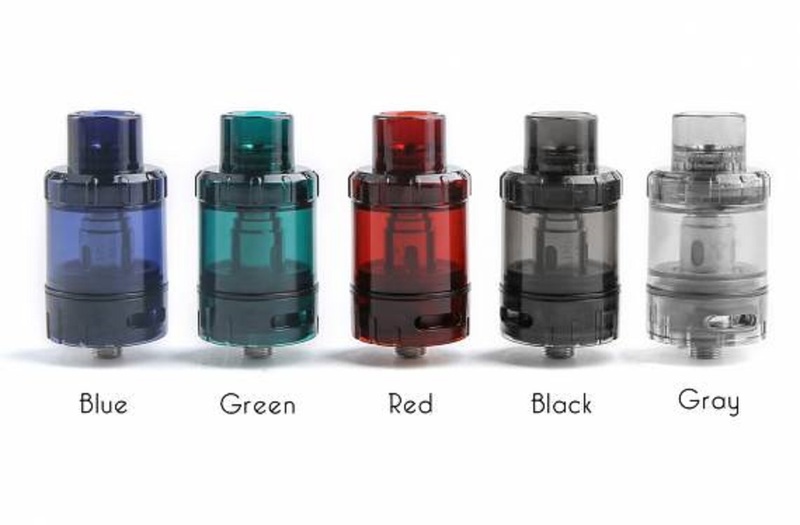 How having the main tank plastic rather than Glass will cope with certain e-liquids known for causing certain plastics to crack i have no idea, but something to think about. What Do I Think Before Vaping? The Citrine 24 is plastic on the outside so of course it has a cheap look to it but the build quality and how it all fits together exceeded my expectations. The threading is actually very good, the airflow control ring moves smoothly and the main section seals great to the base over the o-ring. The top-cap again unscrews and screws back on smoothly due to nice threading and the fill slots are a very generous size. 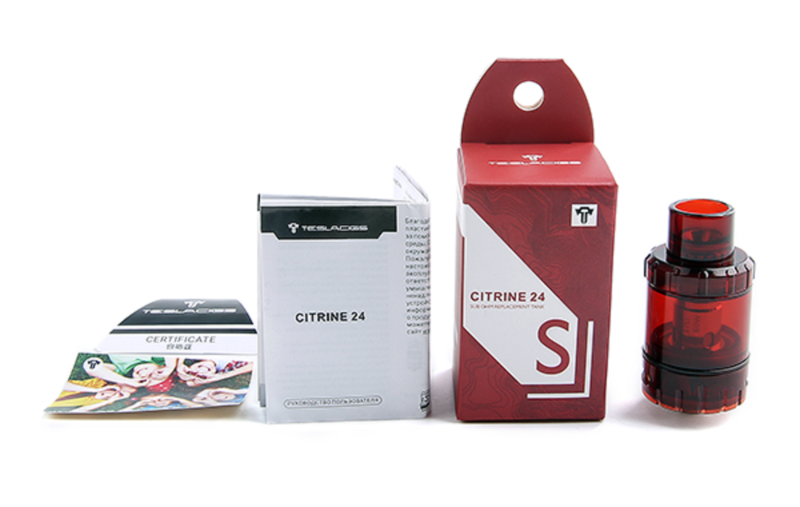 How Does The Citrine 24 Vape? In a word "Fine" nothing wrong with how it vapes at all, flavour is very decent and not shy on cloud production. It gives far more air than i expected and needed the airflow halfway for the restriction i like, flavour was good at 40w but it was on the cool side even for me who doesn't like my vape over warm but at 50w (mid recommendation) it was warmer and flavour marginally better. The airflow has slight turbulence but i have had far worse and to match the turbulence it was a little on the loud side but again we are not talking a jumbo jet taking off just not the quietest. Nothing wrong with having a couple of these for an emergency or when you would rather use something cheaper in certain situations when your a bit worried about the possibility of damaging your tank, i would imagine the Citrine 24 will be far less than a metal tank so if the worse happens and it gets broke no need to shed any tears. I would once again like to thank Gloria from Teslacigs for supplying the Citrine 24 Sub-ohm Tank for the purpose of this review. And the price ? I think it will be good for a back-up tank in emergencies . I did say in the review their was no price available yet. But i have seen on Alibaba where you can buy in bulk and work out from that. These are going to be a low price. As always good job with the review .Though my sub tank days are behind me I could see this as a tank for the work mod,like you have noted one wouldn't lose sleep if it broke ( if the price is right) Also might be a good entry-level tank.